Moving the entire company will certainly require a lot of planning and packing. But it doesn’t have to be difficult when working with professional commercial movers. Serving Chicago, IL, Chicago Office Movers can help you with all aspects of the relocation process by providing experienced commercial moving services. Our team can help you move where you need to be in an efficient manner, transporting everything from heavy machinery, large furniture, inventory, and more. As soon as we arrive to the new location, we can also help you set up everything including desks, computers, and other equipment. Or if you need the items stored for a while until your new location is ready, we would be more than happy to offer this service for you. At Chicago Office Movers, we want you to feel confident that everything will run smoothly during this transition to a new space. Chicago Office Movers is also green company. Using only best practices and recycled packaging, we have reduced our waste and energy costs 30%. Some of our most prestigious clients include Northwestern University, Alcatel Lucent, University of Chicago, and Lake Forest College. We are also multilingual supplier for US government agencies. Corporate moving – Our movers have years of experience in planning and helping corporations, both large and small, reach their new location in an efficient manner. We will guide your employees through the relocation process, move all heavy items using professional equipment, and work with you to determine the whereabouts of each item. Machinery Moving – Everything from moving HVAC equipment to assembly lines, our professionals will have them disassembled (if possible) and transported to the new location in the exact condition they were in before the move. Simply give us a call and let us know the type of equipment needed to be moved so we will be ready on the big day! Commercial Long Distance Moving – Moving across state or even across the country is a big step for a company. But when working with our professionals, you don’t have to worry about the stress of moving everything over there. Simply consider it covered so you can focus on business tasks. Lab and Equipment Moving – Not many movers have the licensing or equipment to move science equipment like we do. From large microscopes to heavy electronics, consider it covered! We can also power your machines using our robust electrical generators. Everything from packing, storing, moving, and unpacking specialty items and equipment, we can have this all completed in a minimum amount of time. Library Moving – Chicago Office Movers can provide the packing and crating services you need in order to efficiently move each and every book to your new location. We will also be able to move large furniture, desks, and other items, giving you the peace of mind you need that everything will be handled professionally. Office Renovation and Remodeling – If you’re looking to replace the furniture in your office and/or need some other large furniture moved around the office to have some remodeling done, we are your experts! Chicago Office Movers can handle the process of providing that new look for your workspace, regardless of the amount of furniture or size of the office. The Teamsters Union is North America's strongest and most diverse labor union. In 1903, the Teamsters started as a merger of the two leading team driver associations. These drivers were the backbone of America’s robust economic growth, but they needed to organize. 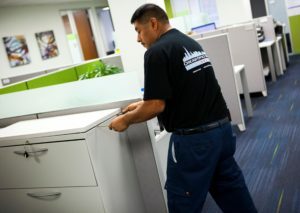 Chicago Office Movers is known as one of the few union movers that serve the city of Chicago. Our professionals are committed to providing you with the moving service that you deserve. Our commitment to professionalism and service has allowed us to move a number of organizations to, from, and within the Chicagoland area. 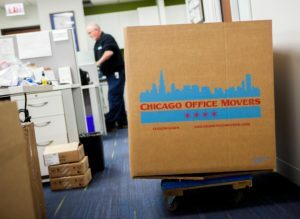 When you choose Chicago Office Movers to relocate your business, you can expect nothing but professionalism and efficiency. Our union movers are experienced, licensed, and background-checked in order to provide you with the peace of mind on moving day. Whether you’re moving down the street or across the world, you can count on us to move your company there in an efficient and seamless matter. Simply give us a call at 312-244-2246 for a free estimate or fill out a contact form and we will contact you shortly!